The Milwaukee M18BJS-0 Jigsaw offers cutting versatility with the 5-position orbital setting which allows you to select the type of speed and cut specific to the application. Fast and easy blade changing is available with the QUICK-LOK™ and ease of use is offered with the tool-free shoe bevel for easy and accurate shoe adjustments. The jigsaw is powered by RED LITHIUM™ which delivers accuracy and ease of use for the user. The jigsaw is available by it self or as a bundle which includes battery/batteries, case and charger. The one thing you need when using a jigsaw is accuracy and a Milwaukee jigsaw will offer you just that and a whole lot more. Features such as the QUICK-LOC blade clamp make them quick and easy to use, while state-of-the-art technology means that the performance they deliver is industry leading. The Milwaukee M18 jigsaw is compact and powerful. It has a shoe bevel that does not require a tool in order to adjust it and allows for a maximum 45-degree bevel. Orbital cutting in 5 positions and pinpoint accuracy make it versatile and high performing. In addition, the Milwaukee jig saws are fitted with a non-marring shoe and this stops the work surface from getting marked or damaged when being worked on. 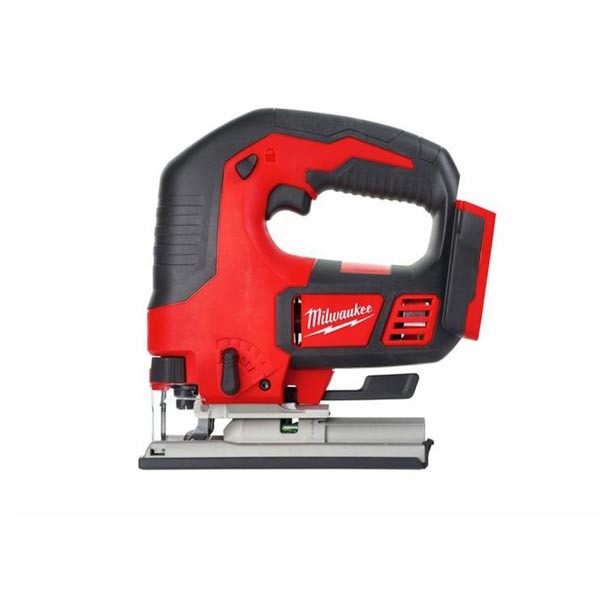 In terms of power, a Milwaukee 18v jigsaw surpasses expectations and is driven by the Milwaukee trademark REDLITHIUM Fuel battery system. This gives exceptional run times, has a gauge to show just how much charge is available and recharging it is fast. Milwaukee cordless jigsaws also benefit from REDLINK Intelligence, another Milwaukee trademark, that provides built in safety features. The technology prevents the batteries and the tool from overloading or overheating and in doing so prolongs the life of the product. Buying a Milwaukee cordless jigsaw from SGS Engineering means that you are investing in the very best and this will be reflected in the results you get from the jobs you do; reliability, accuracy and speed, from the finest design and construction in the power tool arena.